The discipline of weight reduction can be, as many of us know well, a demanding affair. However, this post concerns something different than what might have first sprung to mind. It is about weight reduction in technical objects. In general, valuable objects are expected to be heavy, which helps to communicate the feeling that they are enduring. In wristwatches, using precious metals can increase their weight and help to convey this positive feeling. In cars, it is the sound of a heavy door closing that demonstrates good workmanship. The continual cramming of more and more features into cars over the years has led to ever heavier cars though, and corresponding disadvantages. Thus the reduction of weight has again gained in importance. In cars as well as in sports equipment, the focus is on reducing weight through the use of light metals or carbon fiber, as well as through the application of intelligent designs. We, too, have engaged in this sport of weight reduction and have worked on two projects, each with the aim of creating an extremely light, yet highly functional wristwatch. The first of these projects was launched through a collaboration with a student of the Lucerne University of Applied Sciences and Arts: together, we realized an ultralight annual calendar with a carbon fiber case. Five prototypes, all collector’s items, were built, one of which we officially sold. Inspired by this collaboration, we created annual calendar LIGHT. Due to the radical milling of its titanium case, this watch is nearly as light as the carbon fiber prototype. 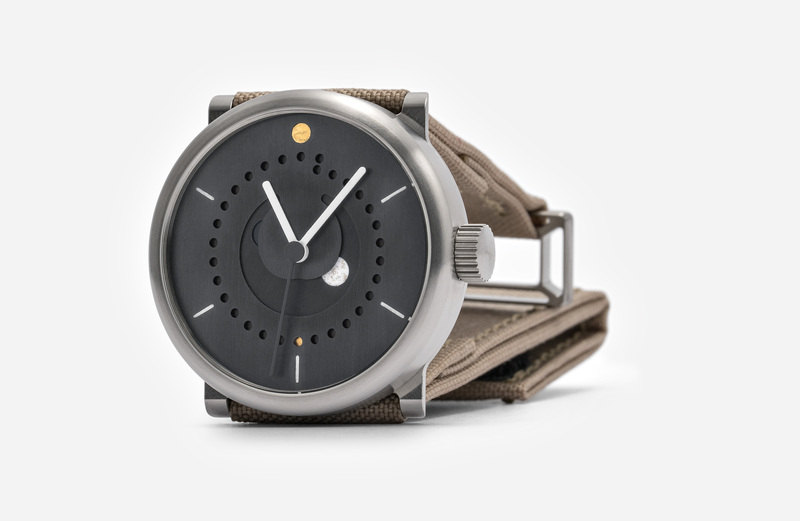 In contrast to the prototype, however, it is waterproof and can be used in exactly the same way as any other ochs und junior – accompanying its owner through all the adventures life holds in store for them. Recently, we rose to the challenge once again, and applied this radical lightweight design to our moon phase watch… and we worked in some romance as well, for a stylish lady from Basel. To build this moon phase LIGHT in 39mm, Peter Cantienimilled an aluminum dial out of a solid block of aluminum, complete with indices and the demanding internal gear that is needed to power the moon disc. This part, as well as the date disc and the three hands, are all made out of aluminum. The black parts have been anodized in order to avoid laying on any additional weight. The indices have been coated by hand with white Super-LumiNova X1. The sun and the date dot have been gilded with gold leaf by Höllmüller. The full moon has been filled with white Super-LumiNova and filings of sterling silver 925 by our in-house watchmaker. And just like for annual calendar LIGHT, the titanium case for this watch has been milled to achieve a radical reduction in weight – just like the titanium buckle. This buckle is an alternative to the carbon buckle. The textile strap is made of beige Cordura fabric and features a Kevlar core. It closes by means of a strong Velcro clasp. Each moon phase LIGHT is custom-made. The price starts at CHF 10’000, including 7.7% Swiss VAT. The price of this watch is CHF 11’000. The weight including strap is similar to annual calendar LIGHT – just a touch under 40 grams. Contact us with your ideas and wishes!